HOLLADAY PHOTO: and twin boys makes family of seven! and twin boys makes family of seven! I enjoy creating birth announcements and other cards for my clients. Often people have an idea of what they envision for a special card and then I work on putting together their vision. 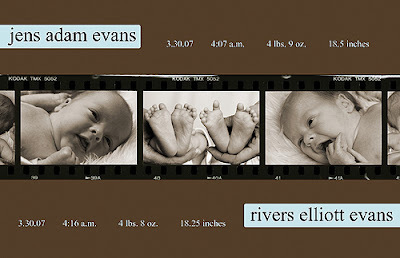 Here is a birth announcement for two beautiful boys. I have decided to start blogging a few of my choice photo sessions. I just photographed these beautiful boys about a month after they were born. Here is a slideshow of the shoot.